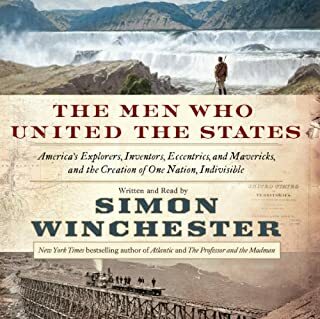 Following his acclaimed Atlantic and The Men Who United the States, New York Times best-selling author Simon Winchester offers an enthralling biography of the Pacific Ocean and its role in the modern world, exploring our relationship with this imposing force of nature. As the Mediterranean shaped the classical world and the Atlantic connected Europe to the New World, the Pacific Ocean defines our tomorrow. With China on the rise, so, too, are the American cities of the West Coast, including Seattle, San Francisco, and the long cluster of towns down the Silicon Valley. Today the Pacific is ascendant. Its geological history has long transformed us - tremendous earthquakes, volcanoes, and tsunamis - but its human history, from a Western perspective, is quite young, beginning with Magellan's 16th-century circumnavigation. It is a natural wonder whose most fascinating history is currently being made. 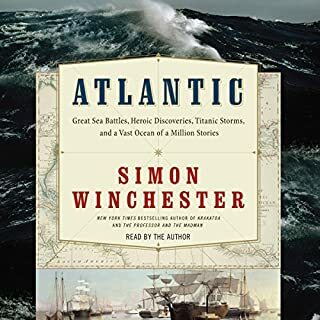 In telling the story of the Pacific, Simon Winchester takes us from the Bering Strait to Cape Horn, from the Yangtze River to the Panama Canal, and to the many small islands and archipelagos that lie in between. He observes the fall of a dictator in Manila, visits aboriginals in Northern Queensland, and is jailed in Tierra del Fuego, the land at the end of the world. His journey encompasses a trip down the Alaska Highway, a stop at the isolated Pitcairn Islands, a trek across South Korea, and a glimpse of its mysterious northern neighbor. Winchester's personal experience is vast and his storytelling second to none. And his historical understanding of the region is formidable, making Pacific a paean to this magnificent sea of beauty, myth, and imagination that is transforming our lives. 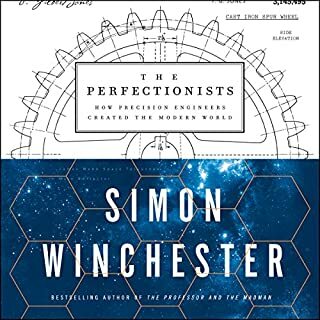 Would you try another book from Simon Winchester and/or Simon Winchester? 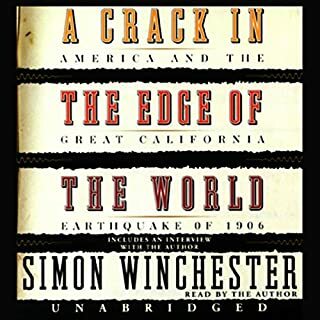 I have liked many of Simon Winchester books, Atlantic, The Crack in the Edge of the Earth, Krakatoa. This is not as good. Would you ever listen to anything by Simon Winchester again? What character would you cut from Pacific? Kill the part about Sony and Surfing, and that boat that's trying to sail around the world. What did you love best about Pacific? Incredible amount of important information made enjoyably digestible and read as only the author can. Serious but with wit. What was one of the most memorable moments of Pacific? The epilog describes the navigating skills of a Polynesian man who enables a team from Hawaii to go to Tahiti without any instruments, simply by "reading" the ocean. History, geology, politics --everyone from Sandra Dee to Douglas McArthur. I couldn't chose, I liked them all. I have listened to all of his books and I am constantly astonished by his knowledge and ability to interweave tectonic plates and weather and history and religion into a coherent and memorable narrative. I look forward to his next book. I've listened to nearly every Simon Winchester recording available. I saw this newest title and jumped on it with eager anticipation. I didn't get far into my expected enjoyment of Winchester's smooth delivery when he began assailing me with his politics. In the past, I rather enjoyed the occasional upper-class sniffling disdain for the business of earning a living or providing security in a difficult world, relishing instead the personal context they provided his wide-ranging observations. But this time, Winchester's politics take front and center stage, and his tone verges on hortatory-- or at least self-righteously condemnatory. I couldn't finish. Topics that involve the Pacific Ocean and us. Would you listen to Pacific again? Why? Yes, selectively to review a particular topic. Non fiction accounts of topics and issues that involve the inhabitants of the Pacific Ocean realm, meaning in a way, all of us. Have you listened to any of Simon Winchester’s other performances before? How does this one compare? This fits into all of his books with deep research, interesting anecdotes and solid performance. No, too many topics, better to give a chapter its full time then take a break and think about what you have just heard. As current as it can be and since i heard the book, there has been a reminder in the news almost every day. 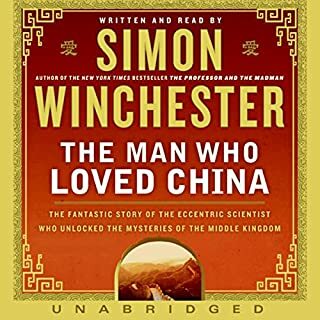 Simon Winchester is a master at finding the eye-opening story, just the right anecdote, the most startling tidbits of history. His book is fascinating; very wide-ranging, and probably the only book I'll ever read that explains how California surfer culture influenced Google. A great listen. 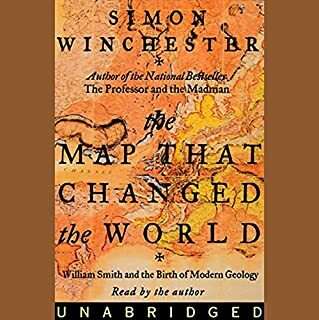 Another great book by Simon Winchester. The combination of his British accent, the many new things I learned, and the breadth of the story, make for a terrific listen. What did you like best about Pacific? What did you like least? Yes: His Krakatoa and Atlantic were respectively a 10 and and 8. I look forward to more books with historical emphasis. Its Simon and he speaks the kings English well. Do you think Pacific needs a follow-up book? Why or why not? This book contained too much proselytizing. His views on immigration are appalling.he thinks Australia is populated with white drunks and lastly he proposes the USA abandon the West Pacific to the Chinese - forgetting our treaty obligations to Korea, Japan, Singapore and the Philippines. Typical far-left clap trap. But he is a left wing British Labor weenie and his tilt understandable. What more can one say? Perhaps the book might have been better served without his far left opinions. I was hoping to get into the populating of the islands, the Cook discoveries, and the 1700-1800 commercialization. We would have been better served with more history and less opinion. I've loved all his work since The Professor and the Madman. Most non fiction like this reads like a disconnected jumble of quotes pulled from diaries, letters and other works. Simon manages to make a compelling story out of scraps and notes. 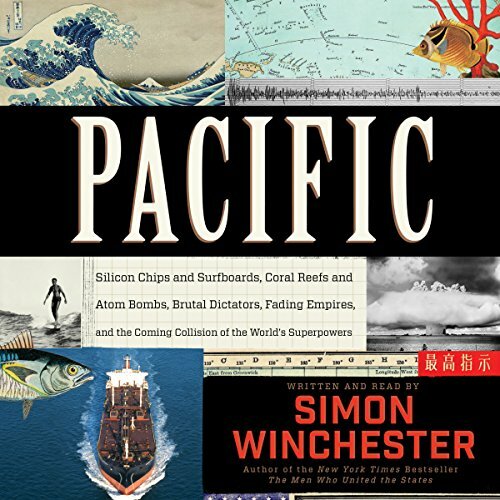 Pacific could well have been the result of a bar bet between friends - "Simon - I dare you to try to write a book with the central character being the ocean and make it a page turner." He's also one of my favorite readers and voices. Another fantastic and insightful book by Simon Winchester. It has a little bit of everything in it, from science to history to prehistory to regional politics. You finish the book realizing you have learned a lot about many things, even weather and global warming. As ever, Simon Winchester weaves all of these aspects of life together in incredibly interesting and captivating ways.